Through 17 games Patrick Kane is leading Chicago and all NHL rookies with 21 points, including seven goals and 14 assists. That’s some high praise coming from a Hall of Famer, but Chicago Blackhawks coach Denis Savard feels there is no argument in the universe that could shoot down his proclamation of Patrick Kane, the Blackhawks’ 18-year-old rookie right wing. Well, that didn’t take long now, did it? 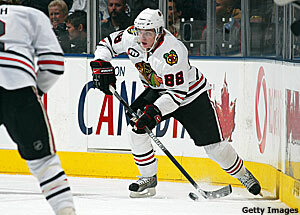 “Right off the bat he showed it,” Blackhawks General Manager Dale Tallon told NHL.com. Kane has made all the necessary adjustments to tailor his game for the NHL, where the players are men, not boys, the game is quicker, and the physical play, especially in the corners and in front of the net, isn’t for the weak. Through 17 games he’s leading Chicago and all NHL rookies with 21 points, including seven goals and 14 assists, putting himself at the top of the list of favorites to take home the Calder Memorial Trophy as the League’s top rookie. Kane, fresh off his ridiculously good one season with the London Knights of the Ontario Hockey League – he put up 145 points to claim the scoring title for the entire Canadian Hockey League last season – was selected first overall by Chicago this past June. Days later, he threw out the first pitch at Wrigley Field, and then he entered Chicago’s prospects camp where he and fellow rookie Jonathan Toews led all scorers with two goals and four assists apiece. “From the summer at prospects camp we had the two together and they just hit it off so well,” Tallon said of Chicago’s rookie pair, the buzz of the NHL so far this season. Next came more summer conditioning before training camp opened in September. Would Kane make it? Would he be sent back to London for another year of experience? Tallon had to be convinced before the Blackhawks played their 10th game that Kane belonged on NHL ice. Figure on him not having to make an easier decision for the rest of his hockey career. Despite his lofty draft status, Kane entered the NHL having to answer questions about his size. He’s only 5-foot-10 and barely 165 pounds, so would he be able to stand up to the League’s checkers, who no doubt have targeted him? Just ask his teammates. They’ll tell you those questions can be put to bed because they’ve witnessed first-hand enough to convince them that with Kane, size really doesn’t matter one lick. Savard even made a point of referencing it during a recent film session. And there it was, Savard calling Kane the Blackhawks’ best player without shaking the tone of his voice. He never broke stride with his train of thought, never once hiccupped after saying the words. Kane said size never has been a factor anywhere he’s been because he doesn’t play a big man’s game. 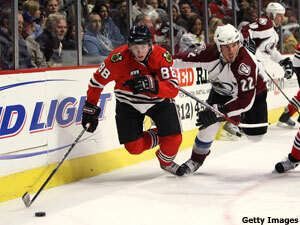 Toews may be competing for that same title, but he won’t argue with his coach. He will go into the corners, but he’s not a mucker or a grinder. He doesn’t barrel in. He skates in with the purpose of digging the puck out and setting up the next play, or getting the Blackhawks’ defensemen the puck for the next rush. For proof how to make it at this size over a career, Kane needs only to look at the man standing behind him on the bench. Savard was roughly 5-10 and 170 pounds for most of his career, yet he scored 473 goals and is in the Hockey Hall of Fame. So, yeah, he’s the best player.